Image Box creates astonishing slide shows from your photos or any images. Select photos, write comments, add music - a spectacular slide show is ready in minutes. Your friends and relatives will appreciate it! Now you can come to your friend, insert a disk and enjoy your photos accompanied with the proper music. Only with Image Box you may create full HD videos of your photos. Or it can be a good idea for presentation. Make a slide show, add the music and comments you need to each image and you are sure to be a success. Image Box makes it possible! 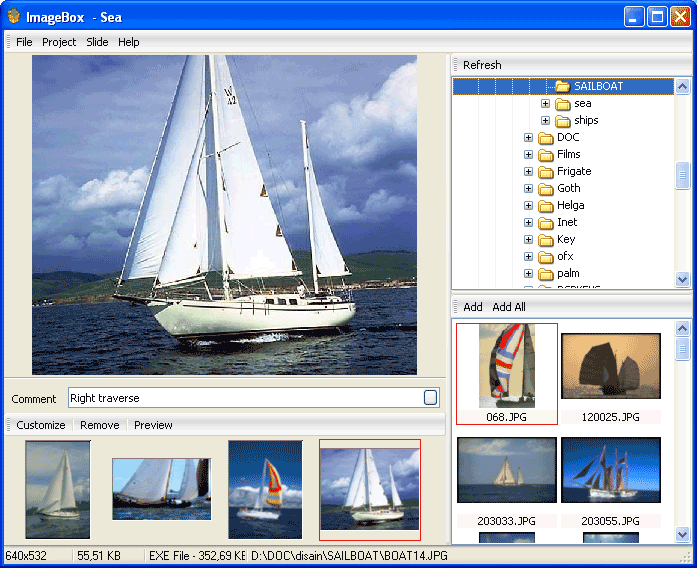 Now you can easily create a file with the slide show of photos which will run on any computer. You may use various graphics formats (.jpeg, .jpg, .gif, .bmp, .png, .pcx, .psd, .tif, .tiff, .tga). You can easily customize your slide shows or save the project to edit it later. Download your free trial copy now to create your own slide show!